A wonderfully zen Japanese robatayaki restaurant with six private tatami rooms and a sushi bar. Experience the traditions of old Japan and savor the sophisticated flavors of traditional Japanese cuisine. Everyday you are able to chose between a variety of lunch sets including Fried Chicken set, Fried Pork Cutlet set, Tempura set, Grilled Fish set or a variety of Sushi sets.The dinner menu features a variety of Kobe beef specialties, Sushi/Sashimi a-la-carte, a wide selection of robatayaki, deep fried tempura, and that is only the beginning. 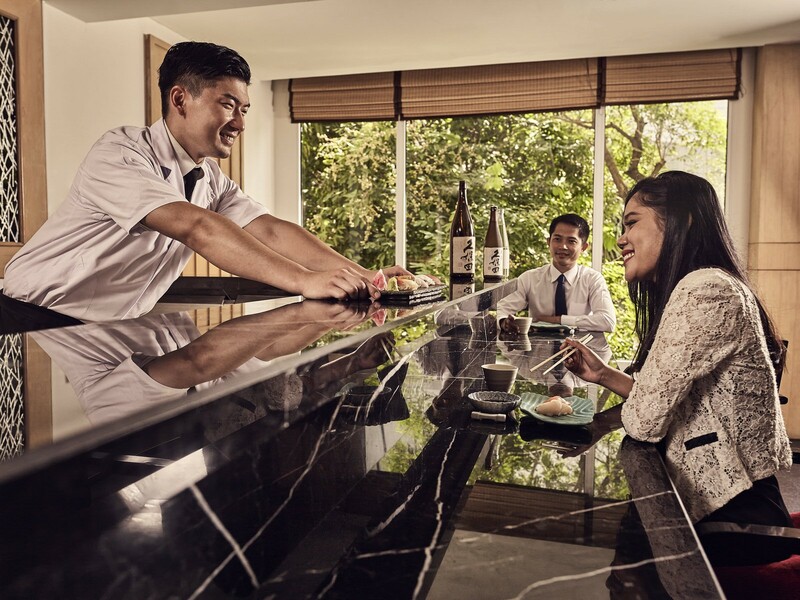 In addition to that, Hachi offers one of the largest selections of Sake in Cambodia. The service is very nice. I will definitely recommend to others! Cómida excelente! Probamos las otras, sashimi de salmón y una variedad de rolls. Muy buena atención. Aclaró que es CARÍSIMO, pero si queres darte el lujo una vez vale la pena. 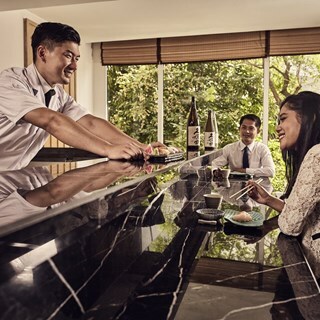 Hachi is always my first priority choice of Japanese restaurants in Phnom Penh as it offers delicious food at reasonable price, together with excellent service quality. I strongly recommend to try Hachi without any doubt for anyone visiting Phnkm Penh. Lawrence Liang, former Chairman of Cathay United Bank (Cambodia) Corp.
Nous avons sélectionné nos plats pour découvrir deux choses qui auraient affecté notre choix (passées sous silence au moment de notre choix):le chef est venu préparer un rouleau saumon et riz (que nous considérons avoir été mal préparé sur le plan esthétique), suivi d’un amuse-bouche au thon. Avoir su, nous aurions éliminé le dernier plat choisi. De plus, le sushi California contenait du tofu: nous ne sommes pas venus au restaurant pour du tofu! Enfin, nous aurions choisi un sushi au thon épicé pour se faire dire qu’il n’y en avait pas mais l’amuse-bouche en contenait. Problème de langue? I  always visited Hachi restaurant for Sushi Buffet on Saturday and business lunch at sometime, the food was excellent as well as the staffs were very welcoming and friendly. Don't miss this Japanese restaurant whenever you're in Phnom Penh. Wonder meals both for lunch and dinner. Good quality, lots of menu choices, reasonable price and excellent service, will try again and again. I want the buffet sushi is have more drink and food. One of a good Japanese restaurant in Phnom Penh, don’t miss this place when you’re in town. At last a wonderful place for Japanese cuisine in Phnom Penh Cambodia. Service was excellent with the experience of the manager Mr Koh. Great food by your in house Chef Mr Yashuhiro. Every thing was fabulous. Will definitely come back again. Well done to the Staff of HACHI.